Botgirl's Digital Playground: Where have all the Second Life blogs and bloggers gone? Where have all the Second Life blogs and bloggers gone? 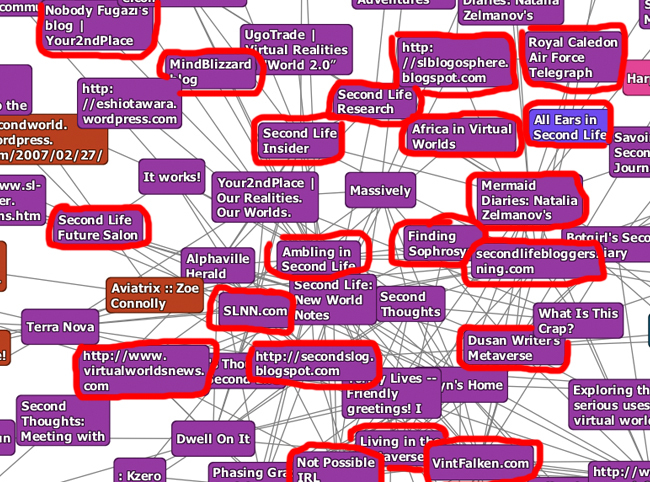 Mind map of Second Life blogs from September 2009 with defunct blogs circled in red. This is a marked up version of an image I posted in September 2009 that visualized a section of "The Web of Second Life Blogs." The red circles indicate blogs that haven't posted in 2012. Many of the most prominent and active Second Lifers from three years ago are either gone or have drastically reduced their avatar-centric lives. This small snapshot alone includes Bettina Tizzy, Vint Falken, Dusan Writer, Sophrosyne Stenvaag and Dandellian Kimban. Although there are certainly new virtual world leaders who have emerged over the last three years, it seems to me that we haven't come close to replacing what can be considered our "greatest generation." Who are the new iconoclasts that are pushing forward the way we live our virtual lives and express our virtual identities? What new communities are pioneering in the way that Extropia did in its prime? Is there anything new under the virtual sun, or have we exhausted its potential? And I wonder how many of us will still be here in another three years. More than a couple of them are still around. I know for me it's a mix of NDAs and less novelty. Things that I'd have blogged back in 06 or 07 don't make me write an entry anymore. More people are moving to the one-liner community. I never had an SL blog but I did have four blogs concurrently, and realised that my readership were all on Facebook and hardly any were reading the blogs any more. Now the only blog I still semi-regularly post to is TEdAMENU, my recipe blog. Everything else I now take care of in facebook postings that get crossposted to Google+ and Twitter, or on one of several facebook pages I've started. I'd suggest that quite a lot of bloggers got disheartened when the audience moved en masse to attentionspanville and their blog was down to an audient, and either just stopped, or moved platforms. And it's just really, really, *really* hard to create (much less sustain) provocative/engaging content consistently and for the long haul. Following Ted and Michele's comments, I think blogs like irez.me are great because they have multiple writers and keep the content flowing. And yea Facebook, Twitter, Plurk and G+ I think have definitely taken the place of a lot of these blogs. I'll still be blogging in 3 years time, but I'm not in any way a "new iconoclasts that are pushing forward the way we live our virtual lives and express our virtual identities" ....more like a chatty neighbour, I think. I don't think the blog format is dead, frankly, any more than I think SL (or the Metaverse) is dead. But I do think that a lot of people have found what they came for and reinvented themselves, or moved on to some other way of life. Second Life is much like First Life in that regard. But blogs HAVE lost the social networking aspect they once had, and if you haven't managed to build a community around your blog, it's unlikely that you will be able to. If that's what you need in order to make the time worthwhile, then the blog will be replaced with some better way of doing that - and facebook and g+, tumblr and twitter, even the SL "wall" thingie are better for that. If you are looking for a way to primarily speak about photograpy, well, flikr is better for that. Especially now that we can once again essentially blog to flickr from inworld. However, if you want to talk about something particular and be a reference point, I still don't see a good substitute for that. If I want to lay down a lot of text with some pictures and make it readable, findable and accessible with a minimum of hassle, throwing up a blog still makes the most sense - particularly when I also wish to keep references and give others an impression of what I'm looking at, where I'm going and what influences me - without it turning into my "day job." But I must say, I look at many blogs - and all the entries I've written simply because I hadn't written much of anything for a while - and become overwhelmed with "meh." There's really no penalty for silence, if you have nothing worth saying. And if it is worth saying, it will still be worth saying, most likely, a year from now. That's the beauty of a blog. Non-ephemeral - and yet, easily updated. Whiskey: Whiskey Shots is my favorite blog to have emerged since then, but it's not really focused on virtual worlds or identity, at least not to the degree of the ones I mentioned. What I love about your approach is that you use the pseudonymous identity to give you the safety to write deeply about your physical world life. Storm: The end of the honeymoon period is certainly a factor. But I wonder why a new crop of people aren't writing about that same period of awe and wonder. Ted: The people I mentioned left while their blogs were at the high point of their popularity. I don't have a sense that SL bloggers who've left did so because they were losing their audience to social networks. From my experience, social networks actually increase blog readership. Michele: Yeah, it is hard. Especially when you are focused on more than commentary on current events (or latest fashion). After about a year of posting mostly about the experience of virtual world identity, I noticed that I was mostly repeating themes I'd already covered many times. I expanded to virtual identity in social networks, but that too ran out of steam as I stopped getting many new blogworthy insights. Most recently, I shifted to focusing on micro-storytelling, with ventures back into virtual identity and virtual world issues as inspiration strikes. For me, blogging isn't only a place to express myself, but a discipline that moves me to create. Gracie: I like irez.me and have posted there from time to time. It's a good way to reach a new audience and a place for posts that don't quite fit my main blog. I love micro-blogs like Twitter, but the short form can't replace the depth and continuity of a focused blog. Soror: I think you do express a very unique and valuable artistic vision that spans virtual and physical worlds. Chatty yes, but quite inspiring. I agree with you that social networks and media sharing sites can't replace the depth and ongoing storytelling that blogging can provide. And also that social networks are better for ongoing chat that builds a sense of friendship and community between many people. I really relate to the "meh" challenge. That's the main reason I've shifted to more visual posts. If I don't have anything worth saying, I can still enjoy sharing a fun image or a short video. I do share them on media sharing sites and social networks, but the blog is a great place to archive it all. I've noticed this too, Botgirl. I think there's a lot of fading interest going around. Maybe with the end of Summer, things will uptick again. I always get confused by people saying there aren't new blogs, I suppose because I seem to be constantly, if gradually, adding to my blogroll as time goes on. Honestly, at this point it's a little out of control! I think it's harder to make a large mark in the field, though, because Secondlifers are a much broader population now. There was a sweet spot of several years ago when people were really at the front of the pack and so a lot of people ended up paying attention; a similar thing happened with stores, where the people who were on the front end of the innovation really had a lot of space to get attention. Now, there are a lot more people, and so getting a sustained community (or, even, any response at all; I've been blogging for a while now and outside of a few "gorgeous pictures" I get now and then through the Color Challenge, any substantive responses I get are one-offs) is very difficult. I could get lots of comments if I did the "gorgeous pictures" and "you're so cute~!" rounds, but I'm far more interested in conversation and response - which is more easy to achieve on larger blogs like Metafilter, where I spend a lot of my commenting and responding time. @Botgirl: You asked, I gave you the reason as I've experienced it. Sole bloggers have a hard enough time keeping output going, and a blog is a place that needs lots of material. It's easy to write a pithy one-liner - I can churn ten, twenty of those out in the time it takes to do one decent blog post. But if you put twenty one-line blog posts up, your readers are going to just go "WTF?" and move to the next blog that offers more material and more insight. So - the "serious" blog readership will gravitate to blogs that have a high throughput, the "serious" bloggers will get picked up by such blogs. The rest of us? I like the fact that I can write a Note on FB and it can be as long as a blog post (I do a lot of them at The Body Friendly FB page I run, and also pick up nuggets in a similar format. On top of that I of course also read or skim several hundred news items all over the web so I can develop new material. But that highlights the other thing that creates the exodus. We like to take in a lot of experience in our online activity. We like to have in-depth material available, but also like to be able to get through a lot of material at one sitting. And that, again, makes the FB/Twitter/Plurk formats so much more suited to consuming quantities rather than quality. Not saying that short format doesn't have quality, a lot of it does. But look at the Gutenberg conundrum (as I call it) which is the dilution of quality through quantity. Before printing presses, there were only a few original works of writing worth painstakingly copying by hand. So only high quality (for the times) writing survived, stuff that was valuable and relevant. To those people of that time, gods and goddesses were very important, so those books were copied right alongside other basic truths (to them) such as planting seasons and herbal remedies. With the advent of printing presses, it became possible to mass produce those books, so that more people could have access to them. This is like the Internet allowing the dissemination of information. Then publishing houses came on the scene, and suddenly people realised that they too had material of interest to contribute, and it wasn't too expensive to do so. This is equivalent to the heyday of blogs, when basically good material was suddenly available to the masses. But you're right, for short messages I use facebook and twitter. Especially when it is just about our sim, messages about that are probably not very interesting to any one else anyway. On the personal blog I only write when I have something to say about how I manage in SL, as 99% of my time in SL is just connected to my sim, that isn't too often. @Botgirl and Ted: the points you make about quality versus quantity, and the importance of input-reflection really resonated for me. During the work day, I often find the noise on all the various social platforms plain overwhelming and of little value (even when I contribute to that noise). What contributing does do for me is perhaps fill a momentary need for drive-through entertainment or drive-through rant. Sometimes I glean something, learn something at the edges, but that's not as often as I'd like. Even when I do, the other problem is there's precious little time usually to go deeper into a topic. Quantity even in my day job seems to be King. It's not so much about the quality of the content, it's much more about how many impressions you make, how great your reach is, how often you are "out there." I don't share that particular view, by the way, but those are definitely some of the forces at play. The "OMG I just made a salad!" view of content creation or the organization-generating-content-just-to-create-the-impression-of-things-in-motion is the equivalent of the author-organization gazing at their own reflection in a pool that really turns out to be a self-made tsunami. Seth Godin says that "ideas that travel win." Ideas have to have quality in order to travel; quantity alone doesn't get them there. Quantity alone suffocates them. Quality ideas, however they are generated, seem to require some process of evaluation and reflection. I just don't know how good ideas come about without input-reflection. On a personal level, my sister and I saw a movie the other day and I just didn't get the humor. It just fell flat for me. It struck me as so superficial, so without wit or cleverness(and the movie wasn't one of those obvious brain candy kind of movies...it was meant to be an intelligent comedy). I told my sister that I just don't seem to have a sense of humor these days, that things many people find raucously funny I just don't see being all that funny. She immediately said she thinks humor has changed, along with so many other things with communication. That even humor doesn't go as deep as it once did, or isn't as well thought out. A generalization to be sure, but I do wonder if she's onto something there. Humor requires a great deal of thought, reflection, synthesizing, perspective, and probably a whole lot of other things. It's just another illustration (possibly) the importance of reflection despite the fact that it seems an activity increasingly marginalized.